I don't typically love salads. Unless said salad has a low greens to non-greens ratio. And that is why I have never frequented Aloha Salads. That and I've never crossed paths with one until two things happened: (1) They opened up in Pearlridge Downtown (next to Kozo Sushi) and (2) I found out they serve sandwiches and wraps too! The wrap that caught my eye was their curried chicken made with curried chicken salad, mango chutney, carrots, cranberries, grapes, coconut, and romaine served on pita bread ($8.25). Absolutely delicious. It was on the sweet side, which I love and I eagerly ate the entire thing. 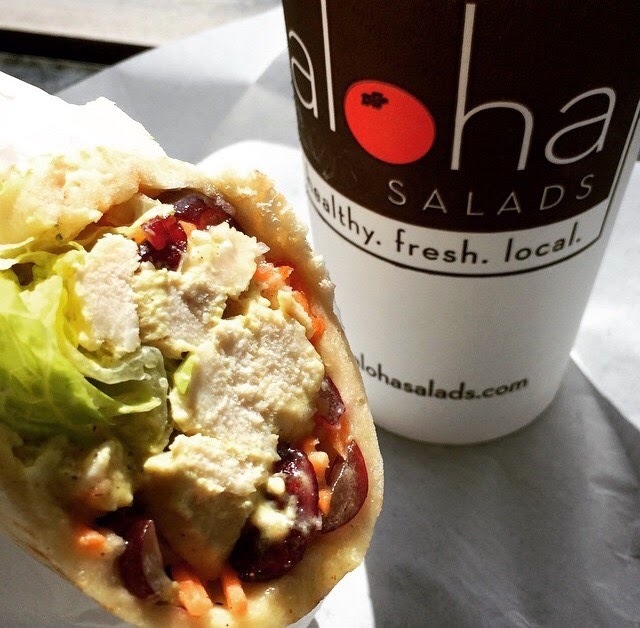 I think it's great that Aloha Salads cares about their customers' health. I was able to find the nutritional information of my wrap on their website. I also found out the pita bread they use is entirely fat and sugar free and their ahi is always fresh, never previously frozen. I must admit, the signature salads they offer do sound pretty delicious, especially the Kamuela cobb and the Kahuku spinach. I also like the idea of customizing my salad. If you just want to run in and pick up your food, there's even a designated parking stall for Aloha Salads right out front. Such a great addition to Pearlridge Mall.